LOS ANGELES -- A basketball fan for life, I have followed the NBA for as long as I can remember, darting way back to my childhood days in Cebu City, Philippines, where I adored the San Antonio Spurs through a 14-inch low-definition TV. I have since become a registered nurse, left my capitol hometown in 2006 and moved to this City of Angels, where I now work tending to the sick and wounded. And while nursing is my true passion, the NBA remains a beloved mistress. Whenever my meager resources would permit, which is rare as a solar eclipse, I would make a pilgrimage to Staples Center and exercise my lungs cheering heartily for the Los Angeles Lakers. But I never imagined returning to Staples last Wednesday as a credentialed journalist, thanks to this website which assigned me to cover the ongoing Western Conference semifinals. And to my editor, boss Dong Secuya, I convey my sincerest gratitude. I ARRIVED at Staples at 4:15 pm. And after finding a $20 parking spot for my SUV at the corner of Olympic and Figueroa streets, I made the short walk to the arena. I picked up my credential in the administration building near the Team LA store and the Magic Johnson statue. The media pass gave me unfettered access inside Staples, including the sacred walls of the players' locker room. With tip-off still a few hours away, I proceeded to the dining room, where I ate as though I would guard Kobe later. I gorged on chicken breast stuffed with assorted cheeses, vine-riped Roma tomatoes and arugula on the side. Coffee crumbled cake and honey-sweetened tea provided the finishing touches. AFTER DINNER I watched courtside both the Lakers and Mavs in their pre-game shoot-around. I also indulged in the guilty pleasure of watching the Laker Girls sway their hips and shake their pom-poms like champions. I met Mark Cuban in the flesh. The billionaire Mavs owner was decked in jeans, a collarless shirt, and well-worn shoes. When the media was finally allowed to enter both locker rooms 45 minutes before tip-off, I quickly went inside the Lakers lair and soaked everything in. Coach Phil Jackson was all smiles as he put his designer suit on. Andrew Bynum lost himself in the book "Psycho Cybernetics," while Ron Artest, clad in Nike pro compression shorts, sat nearby, half-naked and sweating profusely. There was no sighting of Kobe while I was there. Speculation was that he was either getting a pre-game massage or having his sore ankle treated. I WATCHED Game 2 in my assigned seat at B2. There were 150 credentials issued for this game, said Josh of the Lakers PR Dept. And over 50 reporters belonged to the international media. To my left was an Indonesian newspaper writer named Rocky. To my right was an Armenian scribe who looked preoccupied and politely disinterested in any manner of banter, big or small. The game came and went. And so did the Lakers' hopes for a 3-peat, which was dealt a nearly-fatal blow as the Mavericks flew back home to Dallas and stuffed their luggage with a 2-0 series lead. 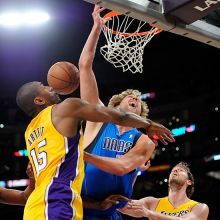 The Lakers may or may not be eliminated in Dallas. I may or may not be credentialed again in the event the series returns to LA for Game 5.